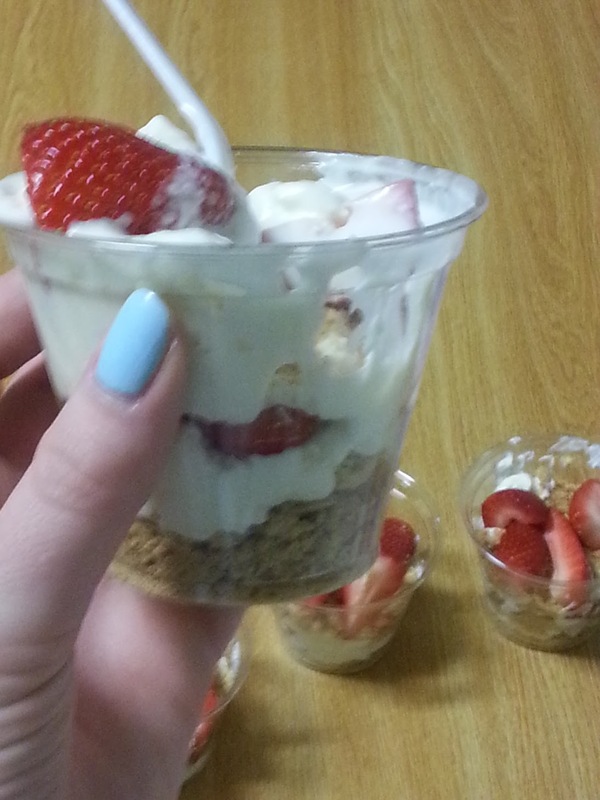 Super Easy Strawberry Cheesecake Parfaits! The first thing we did was cut up the strawberries. Try to cut them into big and small pieces for variety in the sizes. Then, whip together the cream cheese and vanilla yogurt. This part was difficult because I’m on campus and didn’t have a mixer, so the consistency was a bit chunky. I kept whipping it as hard as possible with just a spoon and a bowl, and eventually it got smoother. Add the sugar to the cream mixture and mix that in. Crush the graham crackers until you get a crumb-like consistency. We then layered the parfait with the following: crumbs, cream mixture, strawberries, cream mixture, crumbs, strawberries again. After that, you can add some whipped cream to the top and a few decorative strawberries. Decorating the parfaits were the fun part, and you can really layer them however you’d like! You could also add vanilla extract to the cream cheese mixture to add flavor. However, we didn’t feel like buying a whole thing of it, and the yogurt had a strong vanilla flavor to it anyway. These are perfect because the strawberries and whipped cream were so refreshing for the spring and summer. I can see myself making these for a quick snack if you have the ingredients. 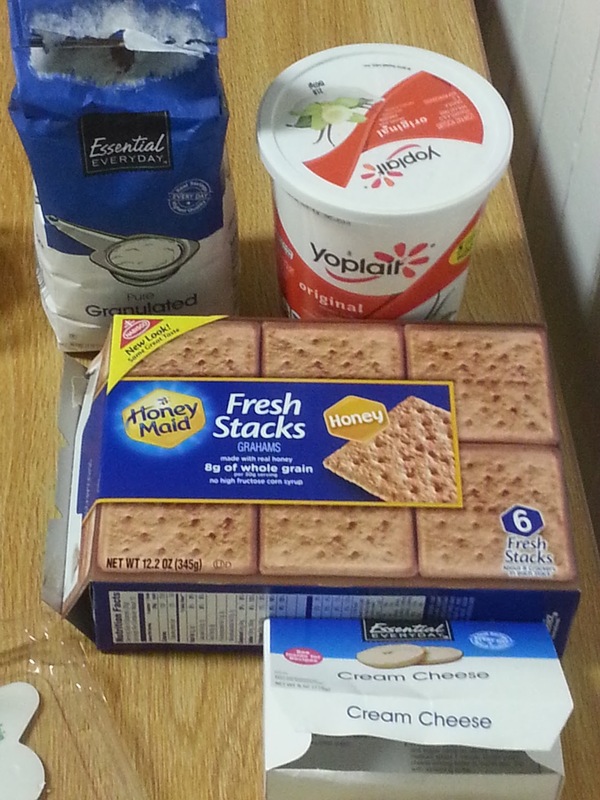 The cream cheese mixture really did taste like cheesecake with the sugar and yogurt added, and the fruit and graham cracker crumbs added to a delicious treat! The easy instruction should make for a semi-healthy, semi-decident dessert! Heather, 20, fashion, beauty, & humor. Always happy without needing a reason. Sometimes you can’t deny buying two copies of a favorite book...does anyone else do this?! 🌧🍃 Wuthering Heights is one of my favorite classics. Gothic and moody novels like this one are what inspire my own writing — and my art! Who else loves the Brontës? What is your favorite work by them? Hello friends, how is everyone doing? Any new book/show recommendations for fall? I started reading this gorgeous book Mary Who Wrote Frankenstein by Linda Bailey a few weeks ago. The artwork is by @juliasardaportabella who is one of my favorite illustrators. I couldn’t get this book out of my head. This is the story of Mary Shelley and how she came to write her masterpiece Frankenstein. I love the tone of the way the story is told mixed with the atmosphere of these gorgeous illustrations. The message is “sometimes a story starts with a dream” and the first time I read it I was very emotional 🌻 I highly recommend it, as it is a children’s picture book and it was so good that I needed to buy myself a copy. My favorite kind of morning ☁️🍃☕️ How does everyone else like their morning routines? I’ve been editing my story and working on some illustrations late into the night which makes me tired in the morning — but today I woke up early and got everything done despite wanting to sleep in 😴 I hope everyone enjoys the beautiful weather! Thank you for coming to check out my blog! I hope you continue to be inspired by my posts! Not everything I use on my site belongs to me, so I will credit as many of the pictures I use as possible. Most of my inspiration posts are from Tumblr, so i only credit Tumblr as the website. If you want to inform me that I have used something of yours, feel free to let me know!